I don’t need the book but want to play!! .. I will add to your prize and give your winner a $10 coupon to use at the MOMSPatterns site so they can try their hand at sewing with patterns when they’re ready to move on up!Here’s my try for fun:Cradle my lipstickCapture the dust from tissuesDeep squares on my hips. I am so frustrated – what about the plus size sewist who DOES aspire to being a fatshionista and doesn’t want to spend the rest of her life grading patterns? *cry*Emptiest pocketsholding nothing but my handwith no room for yours. Cell, cards, keys, toys, wipesmints, scraps, threads, pens, dreamsEasy reach–pockets. Digging deep, I findTissues, tokens and trinketsPockets hide it all. Pockets! I am free.All my needs are stowed within,Let me venture forth. “what about the plus size sewist who DOES aspire to being a fatshionista and doesn’t want to spend the rest of her life grading patterns?”You want Burda Plus magazine. Skinny girls stop me to ask where they can get those clothes. Very fashion forward. We all need pocketsMichelle to the rest of usNo purse – pockets rule! Kangaroo PocketA perfect design, indeedWhy did She stop there? I did get this book, less because of the patterns (elastic-waist skirts? no-lapel jackets? eeeek!) than because of the big section that demonstrates wardrobe capsuling. So I look at it as more of an idea book than anything else. It may indeed find a new home later, but it’s useful for now. I got the book for the basic sewing instructions–it’s not just petite-plus, the patterns are also for (standard-height) plus. The patterns are not my style at all, although I may be able to make something out of the skirt and the jacket. And the pants pattern is certainly basic enough. The added value of the clear instructions for basic patterns and for the most common fit changes (narrow shoulders, big bust, etc.) make it worth my effort to find some nice fabric and walk through the basics of construction. I’ve never managed to make a garment that fit me but this might be my chance. Even though I’m almost six feet tall, I bought this book to help me with wardrobe planning. It’s aces for those of us with no skill in that area. I’m going to use the skirt pattern (it’s cute) and the blouse pattern (ditto)and maybe the jacket pattern, too; just have to lengthen them A LOT which I usually have to do anyway. Would recommend it to those who want to get away from sewing clothes that don’t go with your lifestyle or anything in your closet. . . .and yes, beautiful fabric choices will make a great deal of difference to the look. I am in the process of making the jacket, and found the patterns are made especially for the author’s especial interest, petites. This means I had to alter things a lot more than I would normally . I wish I’d known before I started. Hope it’s not to late to play:Best kind of pocket Found money in an old coat-Trip to fabric store! Contrasting colors,Piping, rickrack, bound welts? No!Don’t have to draw hands! mention pockets anytime anywhere and I call them Erin pockets, that is my tribute to pockets… Erin has created an awareness of the necessity of pockets just by dropping in daily and soaking up the blog…Erin pockets go places, hold things, add interest, can be shaped different but have to be large, Erin pockets make the fashion look! Erin pockets are equal to a hat and gloves with a retro suit.. And I would gladly donate a pattern to the cause.. choose one and then just email me..Have a super week and for all who celebrate Easter have a great upcoming long weekend.. Inside my pocketsSecrets: letters, buttons, charms:I touch them, feel safe. 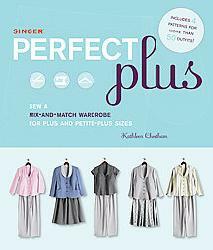 I happened upon this book at the library… I’m not a plus, but it called to me (I do plus sewing for a couple of my DD’s) and while it doesn’t have tons of different designs… I thought it was well put together. Interesting at least. And it does have the patterns too. What’s not to like? A book about sewing, that has patterns in it?You have some very talented readers… I thought of you the other day… I saw some great pockets on something! Thanks for the Burda Plus suggestion, Anonymous! Re-posting “kitten stowaway” ‘cos I miscounted syllables!Pocket-something there?Feel doe-soft ears and paw pads;Kitten stowaway! These are too fun! I put on a dress without pockets this morning. Hence,There are no pockets?The ultimate frustration!How can I fix this? Two for you. First, my husband submits:Through long summer walks,I have to much stuff to hold.Solution: Pockets.And then my own feebler effort:They hold stuff… like handsand buttons and cats and cheese;purses for the hips. What’s in my pockets?The past, mainly; some present,a little future. Ever-runny noseRequires constant handkerchief.Bless you, my pocket! I sew on vacation, but designing is my dream vocation, so here is my ode to the pocket -A pocket full of hopes,A pocket full of dreams,If only I could sew my lovely pocket in a straight seam! I likethe Kitten one too, but this is my favorite is janet’s restless fingers restin in blue gingham pockets. Put stuff in take stuffout. That is what these pockets are always about.